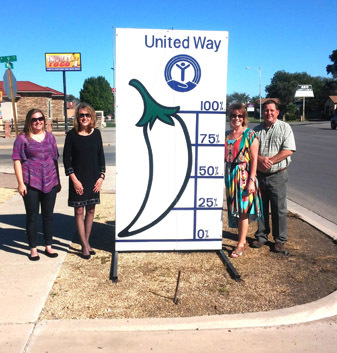 From left, Toni Cano, executive director of the North Eddy County United Way (NECUW), Julie Gibson, 2017 campaign chairman, Leah Boone, assistant secretary, and David Taylor, oil and gas division chairperson, pose with the NECUW’s chile sign on the corner of the Artesia National Bank lot. The NECUW has set a 2017 campaign goal of $110,000 and is currently raising funds for its 14 member agencies. Contributions may be sent to the NECUW at P.O. 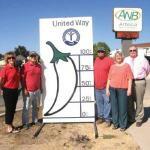 Box 990, Artesia, N.M., 88211-0990. For more information, contact Cano at 308-2702. CVE volunteers Randy White and Kyle Stewart installed the sign.